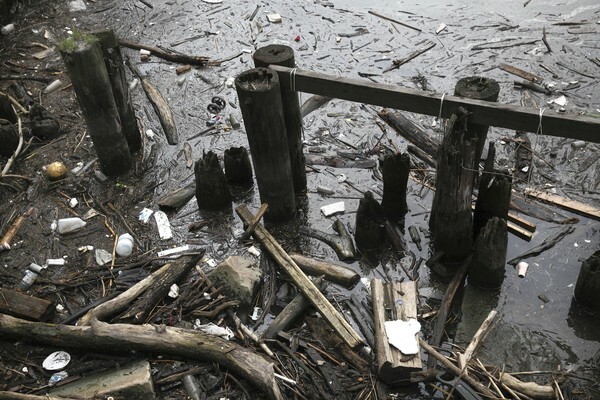 This article from August 4th, 2013, by Chicago Tribune reporter, Abby Olena, recounts the research on trash in the Chicago River and its potential impact on microbial communities that exist in the slimy “biofilms” that cover objects in the water. These little-studied ecosystems are part of the river’s larger ecological processes of oxygen production and consumption, nutrient cycling, etc. Like a doctor with a complicated patient, aquatic ecologist Timothy Hoellein is determined to assess the health of the Chicago River by focusing on one of its major problems: garbage. Hoellein is spearheading an effort to examine trash in the river more carefully than anyone has before. Two years ago, he and his students collected, measured and cataloged all the garbage they could find along some stretches of the North Branch. But that was just a starting point. An assistant professor of biology at Loyola University Chicago, Hoellein ultimately wants to assess the health of the communities of tiny plants and animals that live on that litter and their potential impact on the river’s ecosystem. Called biofilms, these communities are essential to rivers and streams, playing multiple roles in a healthy food web. Microscopic worms and other tiny organisms graze there, and they in turn become food for bigger river-dwellers. The disappearance of a biofilm or a change in the balance of species could affect even the largest animals. Biofilms normally grow on natural materials like rocks, leaf litter and sunken logs — they are what makes river rocks slippery. Hoellein is interested in the idea that biofilms growing on trash are different in ways that could have a larger impact on the river. The project comes as Chicagoans are increasingly viewing the river as a civic asset and recreational waterway rather than an industrialized sewage canal. State and local officials, meanwhile, are under federal pressure to accelerate efforts to improve the river’s water quality. Ultimately, Hoellein would like to contribute to this effort by helping groups trying to clean up the Chicago River better understand the scope of its garbage problem. Scientists and conservation groups want to “engage in the kind of cleanup and prevention that’s going to be most effective,” Hoellein said. But without detailed information about how litter moves through an ecosystem and what its impacts are, no one yet knows what kind of garbage is most harmful, what kind of cleanup works best and how often to schedule cleanups. Hoellein’s research could help put together what scientists know about the many man-made problems in urban rivers, said aquatic ecologist Emma Rosi-Marshall, an associate scientist at the Cary Institute of Ecosystem Studies in Millbrook, N.Y., who is not involved in the study. To tackle his questions, Hoellein and his students first spent the summer of 2011 in waterproof pants, wading in and along multiple 100-meter stretches of the river’s North Branch. They picked up garbage as they went, kicking their feet to dislodge trash from the riverbed. For each piece of garbage, they recorded its density, mass, surface area and material composition. Even though he knew there would be trash in the river, Hoellein said he was surprised by how much his team found in the initial stage of the project: an average of one piece of garbage in the water and one piece at the river’s edge for every step the researchers took. “We found a lot more than was obvious at first glance,” Hoellein said, because much of it was disguised by green and brown biofilms. Composed of layers of algae, bacteria and fungi, biofilms grow on any solid surface where there is a little bit of water. The organisms form an interactive community, cooperating to release substances that connect and protect one another. In addition to forming the bottom of the food chain in the river, biofilms also play a key role in maintaining water quality by breaking down dead material and recycling pollutants. “The bacteria and other biofilm organisms in streams are responsible for breaking down or transforming lots of different pollutants,” Hoellein said. If the biofilms on trash are unable to efficiently process chemicals that qualify as pollutants in large amounts, such as nitrogen and phosphorus, the water quality could decline, which could harm plant and animal life. Margaret Frisbie, executive director for Friends of the Chicago River, said the waterway is home to 70 species of fish as well as frogs, turtles, beavers, otters and birds that make their home on or near the water. “I think people are surprised by the amount of wildlife in the Chicago River,” she said. Hoellein said the top litter categories his team found — by both mass and number — were glass, aluminum and plastic. They also found plenty of cardboard and paper, as well as novelties like a bike and a fire extinguisher. Hoellein and his students recycled or threw away the trash they collected, with the exception of a bowling ball Hoellein keeps in his office. For the next stage of the project, conducted in summer 2012, they gathered pieces of clean litter in each of the top trash categories from the recycling bins at Loyola. They then affixed these items, plus samples of natural materials, to a hard mesh frame and sank them in the river. Eight weeks later, they measured how well the biofilms on each of the different materials grew and released and absorbed oxygen from the water. In May, at the annual meeting of the Society for Freshwater Science in Jacksonville, Fla., Hoellein reported some preliminary results: The biofilms growing on aluminum and glass appeared to release less oxygen than those growing on natural materials. Though it’s too early to know for sure, the finding could mean that living on a piece of trash alters the combination of species in a biofilm. This summer, Hoellein and Loyola microbiologist John Kelly canoed along the North Branch and the North Shore Channel to measure water quality and take sand and sediment samples. They would ultimately like to compare the impact on water quality of biofilms growing on trash and those growing in sand and sediment. Hoellein and Kelly hope to use DNA harvested from different biofilms to determine definitively which species are present on various growing surfaces. “I’m interested in the effects of urbanization on aquatic ecosystems. Chicago is a great place to study this stuff because it’s a big city and we have a lot of fresh water between Lake Michigan and the river,” Kelly said. Hoellein plans to take more collecting trips this fall. He will also combine the information about the types of trash the team found in specific areas of the river and about the biofilm species that live on the different garbage surfaces. This entry was posted in conservation, ecology, news, pollution, research, science, waste, water. Bookmark the permalink.